﻿​For your convenience, we have included that will expedite various building management service requests. Hard copies of all forms are available from the Property Management Office as well. To view and print PDF files, you need the Adobe Acrobat Reader software. The first procedure in any crisis is to call Police/Fire/Rescue at 911 and then the Building’s Management Office at (312) 551-6600. Building Staff should be notified anytime 911 is called so that building personnel can direct the emergency crew to the nearest entrance and quickest route to your suite. The City of Chicago requires each company to develop an Emergency Team. The team members are trained by the Building’s Fire Safety Director to help communicate with and direct coworkers during emergency situations. Create a work order each time you have a need for assistance from us. Tenant work order requests can be submitted here through Building Engines. 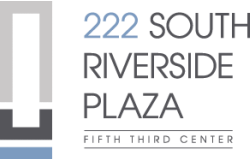 Fifth Third Center at 222 South Riverside Plaza's work order system is fully web-enabled and designed to manage and streamline the request, tracking and completing process. Please create a work order each time you have a need for assistance from the building on site trade personnel.